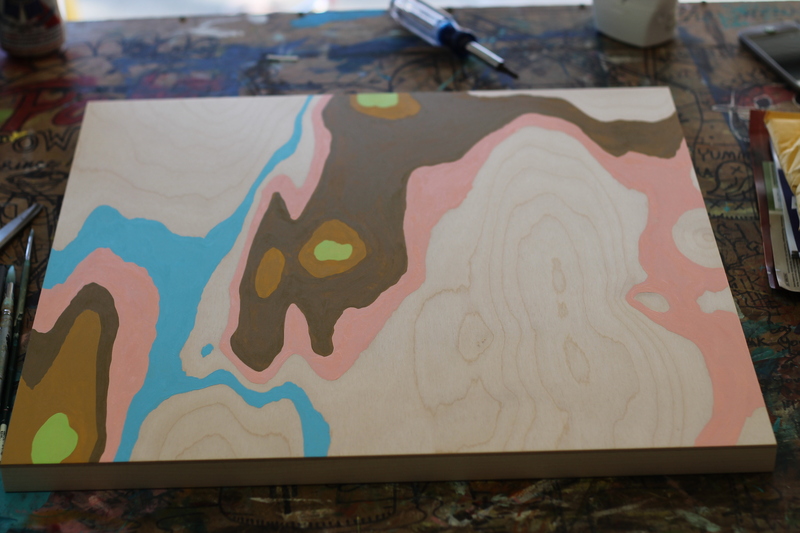 Wood panels have been consuming the majority of my creative impulses at the moment. I can’t get enough! I love every aspect of painting on them. The prep is faster compared to canvas because there is almost no downtime. You just sand and go vs. priming a canvas with gesso and having to wait for it to dry before beginning. I also really like the ability to lean into the artwork without worrying about creating divots in the canvas. For these new paintings I have taken my love of the materials on step further. When I was sanding these I couldn’t stop thinking about the natural pattern of the wood grain – and from that these were created. The first was designed entirely around the wood grain. I really liked the contrasting natural lines and curves with the bright, bold color palette. I have several more on deck waiting for a similar treatment. The second painting was designed around the wood grain, using the image of a bear as a frame to showcase it. I really like how this turned out and think there will be many more of these funky animals in my future. Again, I really like the color palette set against the image of the black bear and the way his body is elongated to allow as much of the natural pattern to show through as possible. Don’t get me wrong, I still love painting on canvas and stretching my own stuff. These wood panels are just a nice break for now.